The holiday season is a very exciting time at Maple Springs. The weeks leading up to Christmas is a time families come together in preparation of the celebration of the birth of our Savior. The “Children’s Christmas Program” will be on December 9, at 6:00 pm. Each year the children at Maple Springs are always one of the highlights of the season. Plan to come early as the church will be having our Holiday Meal at 5 pm. After the program we will have dessert and time to enjoy church family and friends. Food, fun, and fellowship…always a great time! Two Sundays before Christmas, December 16, our sanctuary choir will present the cantata, “Peace Has Come”, in the morning service at 11 am. 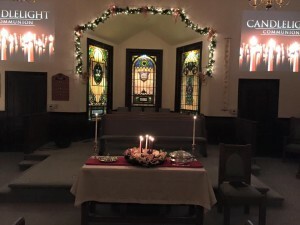 Our Candlelight Communion will be on Wednesday, December 19 from 7 -8 pm. This is a special time for family communion that you will not want to miss. Lastly, December 23 will be our Christmas services, Sunday School at 10 am and Worship at 11 am.